A new feature for the Employers Toolbox online is Visitor Management. Knowing exactly who is at your work site and where they are at any given point is vital during an emergency situation or performing drills. Getting your receptionist to grab the visitor register from the desk often gets forgotten in real situations. Having this managed online has obvious benefits. 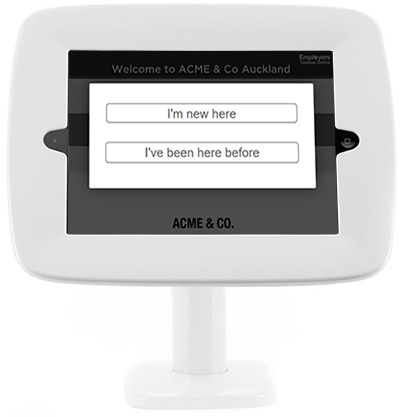 Catering for new and repeat visitors, this system provides a speedy and accurate way for your visitors to quickly sign in, eliminating writing errors, legibility issues and physical books. Empower your staff with an online system. Fully integrated with your Toolbox staff records, departments and branches. 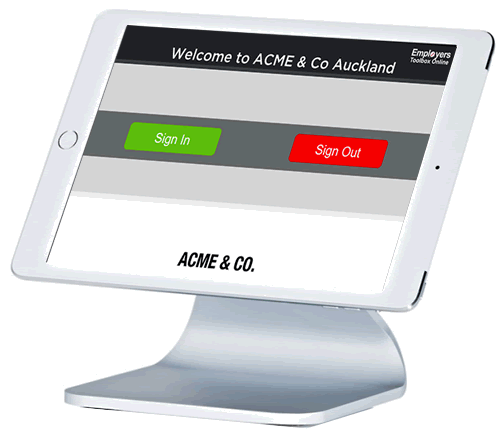 No extra configuration required, automatically creates a welcome screen for each branch as configured in your Toolbox account, uses your company details, a name and logo. Centralised reporting from within your Toolbox account. Print or email live visitor information to your fire wardens or management in an instant. Upgrade your reception's visitor book and integrate your visitor management with your Health & Safety management system. All users of the Employers Toolbox already have access to this feature. There is a button announcing 'Visitor Portal' on the right hand side of the Dashboard, the same in the Health & Safety homepage.